Libraries across the county are getting ready to celebrate Lancashire Day on Tuesday, November 27, with a number of events taking place to mark the occasion. Lancashire Day dates back to 1295, when the county sent its first representatives to Parliament, which marked Lancashire’s move into the wider sphere of politics. Euxton Library will be celebrating the occasion with Mr Lancashire, Sid Calderbank, on Monday, November 26, from 10am to 12 noon. Sid will be accompanied by the Lancashire Dialect Reading Group to share songs, stories and poems of old Lancashire. Garstang Library will celebrate the occasion by welcoming people to share their memories while enjoying a cup of tea or coffee from 10am to 11am. The local history resources will also be available for visitors to use to research the past. Savick Library will welcome Joseph Boe, the brother of the world-famous tenor and actor, Alfie Boe from 11am to noon. Joseph will be performing traditional folk songs about the origins of lifeboats, the demise of Fleetwood’s fishing industry, and some more recent songs. 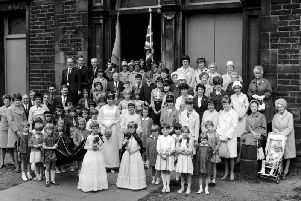 Brierfield Library will hold an afternoon tea, while members of the public are also invited to take part in a quiz about Lancashire Day. Both of these events will take place from 2pm to 4pm. Knott End Library will also entertain visitors with a Lancashire Day quiz from 2pm to 3pm. County Coun Peter Buckley, Lancashire County Council’s cabinet member for community and cultural services, said: “We’ve certainly got a good range of events for people to celebrate this historic day. All of the events are free. Anyone who lives in the UK can join a Lancashire library, either online or by visiting in person. Membership is free and there are no age restrictions. For more information about the events, go to http://bit.ly/lancashireday or call 0300 123 6703.